Winter is fast approaching! Fingerless gloves may seem pointless. However, for those who work with their hands and cannot work with covered fingers, fingerless gloves are a wonderful thing to have when hands get cold. 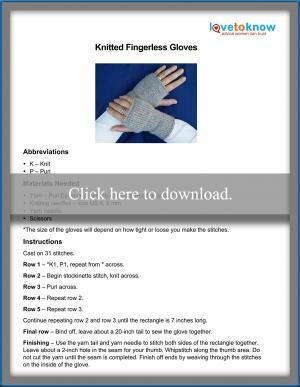 To create a pair of knitted fingerless gloves, you will need a few essential items. One skein of yarn - Purl Essence Sincerely Oatmeal Heather acrylic yarn is used for the gloves shown. Adjust the size of your knitting needles, if needed. If you knit tight stitches, go up a size in needles. If you knit loosely, go down a size. This pattern is easy enough for beginners or a quick project for more advanced knitters. The pattern fits an average adult female hand. Adjust stitches as needed to fit your hand. These gloves are made with acrylic yarn but can also be made with wool or cotton. If you are not into neutral colors, go as bold as you like with your color choice. Click on the image below to open the pattern in a new window as an Adobe PDF file. This pattern is simple and is great practice for beginners to learn how to knit and purl. After a row that serves as the cuff, it is a stockinette stitch. Begin the gloves by casting on 31 stitches. The next row, row 1, is the cuff that keeps the gloves from rolling. For this row, you will knit one stitch and purl one stitch. Row 2 begins the stockinette stitch where you will knit across the 31 stitches. On row 3, you will purl across the 31 stitches. Purling can be tricky for beginners. Patience is key. Starting with row 4, repeat rows 2 and 3 until your rectangle reaches seven inches long. Once you reach seven inches, the last row you will bind off. Leave about a 20 inch tail of yarn to sew the seam of the glove. Use the yarn needle with the tail of the yarn to stitch the seam by folding the glove in half lengthwise. Use your hand as the guide for where to start and stop the thumb hole. This will typically be about a two inch hole. Do not cut the yarn. Whipstitch the edge of one side to move the needle and yarn down to where you will end the thumb hole. Pick up stitching the seam at that point. When the seam is completed, weave in the ends of the yarn from the beginning of the glove and the end. Repeat this process for the second glove. If you are a beginner at knitting, you will find that your stitches may become uneven from row to row or even stitch to stitch. Knitting should not be a stressful endeavor. If you find you are knitting so tight that you cannot work the next row, take a deep breath and relax. Then, you become a master of the frog stitch and rip it, rip it, rip it. The best thing to fix that situation is to rip out the row of stitches that are too tight to work. Do this gently so you do not rip too many stitches out. Once you are at the end of the row, carefully work your knitting needle back through the loops and work the row again. Make sure you are not holding the yarn with too much tension on it. The same goes for stitches that are too loose. Rip them out and start the row again. Otherwise, you will have a ripple in your work. Make sure that your keep even tension on the yarn as you pull the stitches through the loops and off the needles. 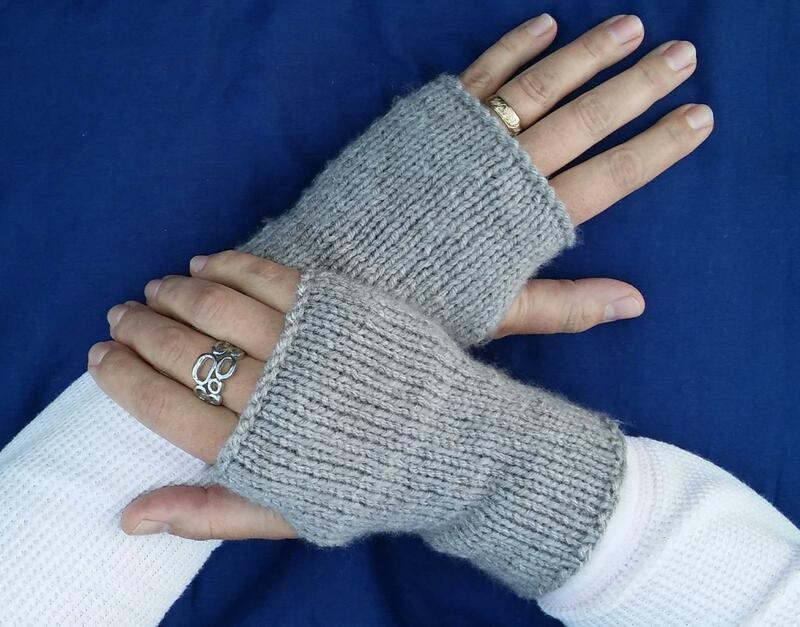 Fingerless gloves make thoughtful gifts if you have a relative or friend who always complains of cold hands or has arthritis. Make them in their favorite color or a pretty neutral. Embellishments, such as buttons or bows, can be added as well to give them a bit of flair. The gift of warmth will be welcome regardless of how fancy you make the gloves.